I leave Belmont at 5am. I stayed with an FCA teammate, Michelle Ladcani, and her family last night. Troy and I met Michelle at the starting line of the Boston marathon in 2012. She joined me at the Napa Marathon this year to celebrate my 40th birthday. What a great night hanging out and enjoying their amazing view of the whole bay! 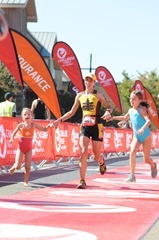 It is different to be doing a race alone without my family but I know they are supporting me from afar! My plan is to park between the starting line and the finish at Lafayette Park. Thankfully, I find a spot without much circling. With my headlamp on, I run to the start. It’s crazy! There are 25,000 people here and it’s a mad house! I find my way to my starting gate and it’s much calmer here. I see Betsy Davis of Tri-California and we get a chance to catch up and pray for each other. Soon Joan Benoit Samuelson comes out and gives us some words of encouragement. I remember watching her run in the first women’s Olympic marathon. My mom took me to Los Angeles to watch that historic day. Very cool to see her out here! Okay, ready to go! The air horns sound and the mob begins it’s way down Post St. Even though I’m one of the first starting gates, I still have to dodge a lot of folks before I can really get going. I’m trying to stay with the 1:40 pacer. That’s about 7:38 per mile. 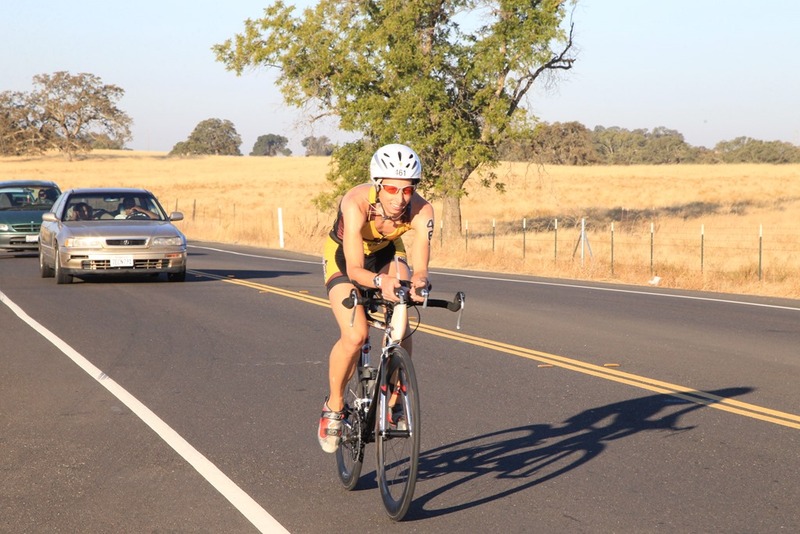 I haven’t been putting in the mileage usually needed to go fast but I did run a 1:44 a few weeks ago in the Challenge Rancho Cordova half iron distance. I finally catch up to the pacer a half mile later. One gal is dressed as Buzz Lightyear. Amazing to watch her “wings” bounce around as she runs a quick pace! Mile 1 is 7:20. A downhill first mile with adrenaline makes for a fast split. I imagine the pacer is looking ahead to the many hills and needs to stay ahead of pace. Mile 2 is 7:22. 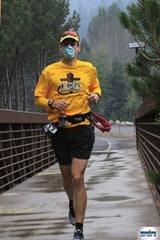 We go through the first aid station and the pacer doesn’t grab anything. I sure hope she’ll get to drink something. I think about trying to grab her something down the road. I’m loaded up today carrying my own drink along with my car keys and phone. Although a lot to carry, it is very convenient to be self sufficient! Mile 3 is 7:48. I’m starting to fall back from the pacer. The fast pace she is setting is just something I am unable to hold especially with my hamstrings tightening up. I just need to keep her in sight. Mile 4 is 7:22. We are running through Golden Gate Park. The sun is starting to rise, it’s mostly quiet and very beautiful. It’s hard though to soak it all in with the discomfort. I can still see the pacer, yeah! Mile 5 is 7:27. There are all kinds of folks entertaining and cheering along the way. The aid stations are well manned. I wonder what these spots will look like after most of the runners have come through. Thanks, God, for these folks that volunteer to help and clean up! Without them, this wouldn’t be possible. Mile 6 is 7:25. I’m hanging in there. I am at my max leg speed. My hamstrings are very sore and I’m thinking of tricks I can do to ease the pain. Mile 7 is 7:25. Man, this park is massive! I’m running by the cross country course I did here several years back. I remember the great shape I was in back then and running the Women’s Nike Half in 1:30. I would love to be there again…but I’m totally content with what I can eek out today! Mile 8 is 7:46. Out of the park now. The bigger hills are coming! I can barely see the 1:40 pacer but I know that I am still on track to run 1:40…it all depends on the hamstrings. Please Lord help me to persevere! Mile 9 is 7:44. We’ve been getting some more rollers now…time to prep for the BIG hill coming! Mile 10 is 7:34. And the BIG hill is here! Usually I run down this hill…in the first Women’s Nike I did and the SF Marathon. Coming from Auburn, I hope to have an advantage climbing. I soon see a sign that says 1000 meters to go. Oh, I can handle that, right? In the next quarter mile I find more girls are passing me and I’m struggling. Wow, I totally underestimated the difficultly of this hill! When is it going to end?! I hear a girl shout an explicative about the hill…we all deal with these things differently. I just want to put my energy into getting to the top. Mile 11 is 8:32. Done! Phew, that was hard!! I look at my watch and see that it’s going to be close. I have a goal to be the passer as much as possible and not be be passed. Mile 12 is 7:12. I’m really trying to push it now. I’m surprised by how limited I feel. I feel like I’ve maxed out on the speed my legs can go. I just gotta push. A few girls have passed me but mostly I’m keeping my goal. Thank you Lord for sustaining me! Mile 13 is 7:19. The finish is near! I cannot speed up anymore but I am able to maintain. As I’m about to cross the finish I look up to the sky and thank God for getting me here. I hear the announcer, Sean English, well known from Wildflower, say “and here comes FCA Endurance”. It’s nice that our team gets a shout out! I cross the line at 1:40:53! Yeah, I did it with Christ! So great to be done! I get my Tiffany’s necklace and walk towards the firefighters in their tuxes. I could open the blue box and get my picture with them but I decide to take it home and open it with the most handsome man in my life, Troy. I call Troy and the girls and we celebrate! Time to drive home and give them some hugs! Not sure what to expect today. 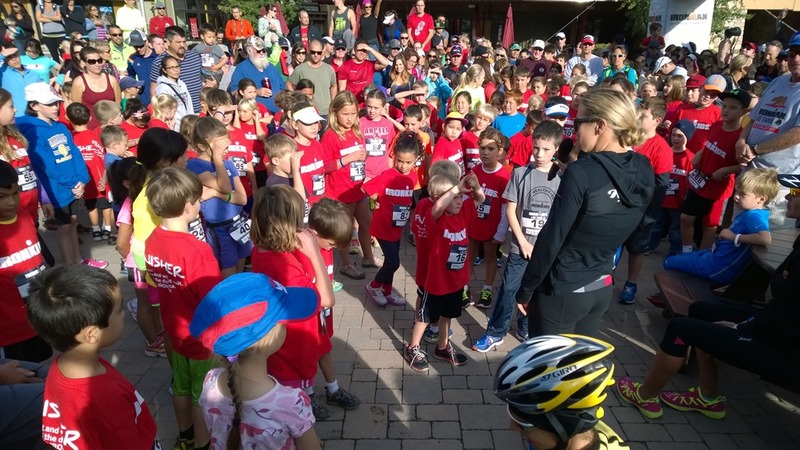 Troy’s Ironman prep and organizing the girl’s school jog-a-thon left little time for training. But fortunately I did still get some training in. Hopefully it will be enough not to suffer too badly. We are up early and on our way to the start. We arrive and are able to park right next to transition. Sweet! It’s pitch black out here. I have to carefully make my way to my bike which stayed the night in transition. Soon it’s time to head down to the swim start for the FCA pre-race prayer. It’s starts off as a small group, including two gals from our swim team, and grows by the end. 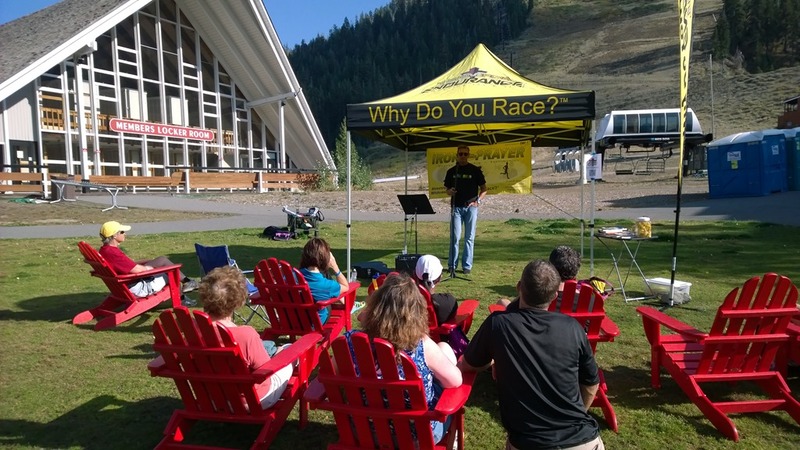 We finish and I chat with some folks and encourage them to enjoy the day. Troy and I pray with a gentleman who is grieving the tragic loss of his son. It was a rainy night 2 years ago. His little boy ran out in the street. He unknowingly hit him with his truck. It was an accident that lives with him everyday. My heart breaks for this man and as we part ways, I turn to Troy and cry. I cannot imagine being in his shoes. It puts the day in perspective. Life is precious! Lord, thank you for my family! Thank you for this life and what you’ve given me! Help me not take that for granted! I jump in and get a nice warm-up. I swim to the start. I feel surprisingly good and the nerves are flowing…all good signs! It’s hard to believe since I’ve only been to the pool barely once a week! Ready, set, go! I get off the line well and am right behind the top girls. I focus on keeping my form together so that with each stroke I’m moving forward better and faster. It pays off and by the first buoy, I’m holding my position in 5th. There is a girl that’s been slightly ahead and though I’m not right on her toes, I am in her slipstream. At the next buoy, I’m still on track and head back towards the start. Another girl comes alongside and we stay neck and neck until the last buoy. I’m surprised how good I still feel. I’m working hard but not loosing steam. On the last turn, I dig deep and pull ahead slightly. I can see the finish! I’m home free! I surge to the ramp and run out ahead, still in 5th. I pull over and take my wetsuit off. It comes off with no problems! Thank you God! I high five the girls and run to my bike. I make fast transition and run out. I still struggle a bit putting my feet into my shoes already mounted on my pedals. I do better but it’s still something I need to work on…or I’m going to take someone (or myself) out one of these days if I don’t. Mile 5: I make it out of Folsom and am now on the back country roads. It’s hard to tell what place I’m it but so far I’ve passed a few under 40 gals…and no gals have come past yet. I feel pretty comfortable but my hamstrings are already talking to me a little bit. Troy lowered my seat in hopes that it would provide some relief. We’ll see how the next miles go. Mile 10: I’ve been passed by a few gals that are not in my age group. One was 57 years old!! I am in awe! She leaves me in the dust! Another gal, Muddy Water’s team, I’m able to keep in my sight. Mile 20: My hamstrings are pretty sore now and I find relief in holding a few different positions on my seat. I’ve lost sight of the Muddy gal and a few others have passed me. This last handful of miles have been on Latrobe Road and it’s mostly flat…a weakness of mine. The negative thoughts start creeping in. Mile 30: Finally I’m off Latrobe. Hwy 16 is another long stretch of road. I’m slowly starting to reel in a few of the gals including Muddy’s girl. My hamstrings are really sore and I find a position that helps some and try to stay there. Mile 40: So ready to get off the bike…but not totally excited to run yet. Though my hamstrings are still hurting, I seem to be ganging some momentum. I should be sub 3 hours…sweet! Mile 50: The end is so close!! The run is sounding better and better with every mile! I have no idea where I stand among my competitors…must push hard to the end no matter what! I’ve been able to re-pass some girls but the Muddy girl alludes me! Mile 55: Homestretch! I can see the finish and folks already running. I get to transition and hand off my bike to a volunteer. Okay, it’s go time now! Whoa, I’m tight and sore! I make a quick transition but as I’m just about to exit, I realize my Garmin is still on my bike. I run back to the racks and have no idea where they put my bike. A few super volunteers lead me to it and then I’m off once again. Here we go! Once out of transition my running legs start to kick in. A half mile later I’m running past the Expo/Finish area where Troy and the girls are camped out at with the FCA tent. Anna and Ariel stop playing at the water play area for a moment to join me for a little bit. So great to see their smiling faces! Troy takes a break too to cheer me on, too. This is a 2 loop run. It’s warming up quick and seems to be in the low 90’s already. It will become more challenging as I go along! Mile 1 is 7:51. I’m surprised that I can go under 8 min pace since my hamstrings were bothering me on the bike and I haven’t been able to run much lately. I feel like I could push harder, too, but I decide not to risk it. I just focus on holding here. A few guys have passed me but I get a big surprise when this pro goes by me like a flash…wow (he went on to run 1:14 for the course!). Mile 2 is 7:56. Still feeling strong and slowly catching folks ahead of me. Mile 3 is 7:52. No shade makes it tough but I’m still feeling great! 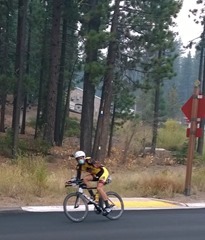 A girl with a “Tri 4 Him” jersey flies by. We encourage each other. Soon after a few more girls pass by and I realize they are all pro women on the 2nd loop of the run. I sure hope the Tri 4 Him gal can hold them off! Mile 4 is 7:54. Still feeling solid and my hamstrings are good! I take a Hammer gel. Mile 5 is 8:00. Not sure why I slowed down but my pace bounces back. The plan is to try to hold this until Mile 9 and then try to pick it up. Mile 6 is 7:57. Another pro lady passes me. How I wish this were the end of my second loop! Soon enough I’m back to the Expo/Finish. I see our friend and pro Brad Seng cheering for me! I am so surprised. I stop and give him a hug. Sarah Outman is cheering and I wave. I see Troy and he asks me how I’m doing. This next loop will be very telling! I might be able to break 5:10…maybe even 5:05! That would be super awesome and a PR I think! Mile 7 is 7:51. Wow, maybe I can really turn it on at mile 9! This is going great! I see Todd Osterberg and tell him great job. Mile 8 is 8:05. Oh boy, still feel good but doubting holding the pace. Mile 9 is 7:54. Okay, back to normal. I take a Hammer gel. Time to start pushing…but it’s hard…maybe I’ll wait another mile. Mile 10 is 8:04. I finally can grab some Coke at the next aid station. I don’t feel as energetic and it’s almost as if my body is spending energy digesting the gel instead of giving me energy. Hopefully the caffeine will kick in. Mile 11 is 8:15. Oh boy, loosing energy! The next aid station doesn’t have Coke…oh dear! Forget speeding up, don’t slow down! Lord help me hold it together. Mile 12 is 8:15. Hanging on! I’m not totally falling apart but I’m definitely going downhill. Soon I can hear the announcer at the finish line. Yeah! This is almost over. I’m really wiped out now and it is so hard to keep moving. I tell myself that I can lay down at the finish line. The excitement of being done helps me pick up the pace. Mile 13 is 7:58. Alright, there is the finish chute…wait a second…I have to run around some buildings first? What torture. I smile anyway because it’s almost over and I’ve got a great time going! I round the corner and there are the girls waiting to run in with me. 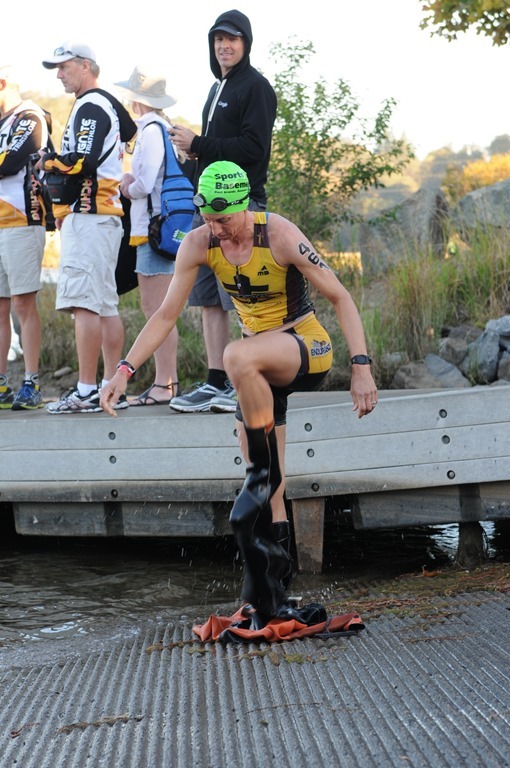 I see Troy and ask him if this is okay with the race officials to finish with the girls and he gives me a thumbs up…yeah! Most races don’t let you finish with family anymore. I miss running in with my girls! This is awesome! We grab hands and run in together. What a great way to end the day! THANK YOU JESUS! BTW, to top it off, I did get to lay down and Anna took really great care of me! 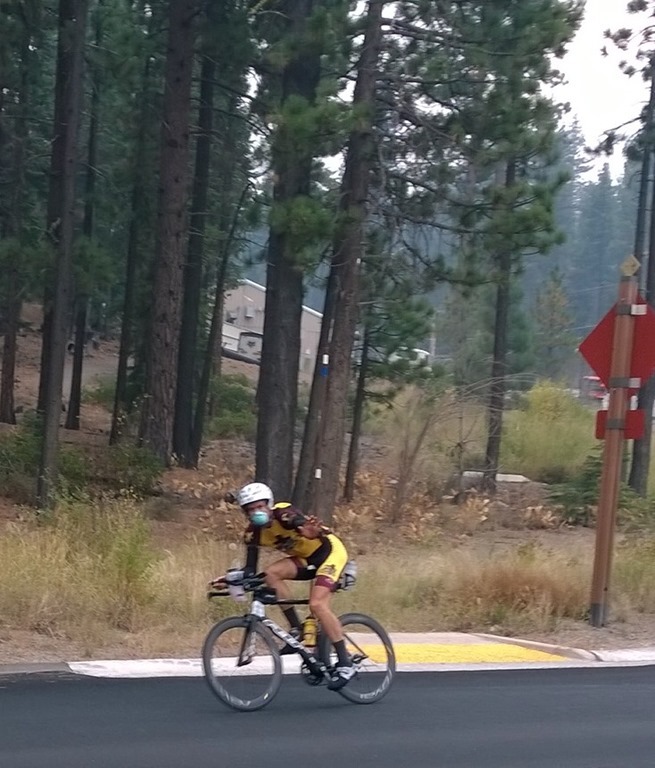 This was it, the week of Ironman Lake Tahoe. I drive up to the cabin 5 days before the race, run a couple miles in the evening, and then get locked out of the cabin, requiring me to drive home for the extra key. Not the early bedtime I was hoping, but God will make it all work out. 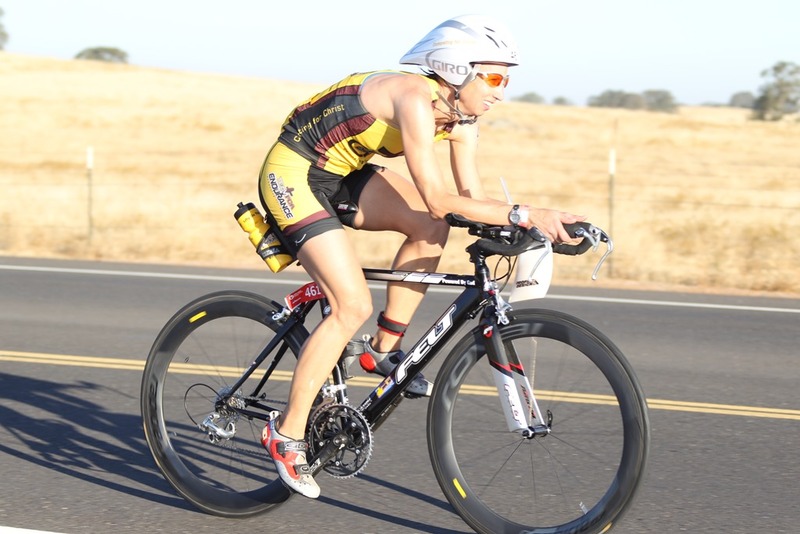 The next day I swim with Teammate, Flor Hodges, have breakfast with Flor and friend, Chad Moore from Texas, and then ride 14 miles, still adjusting my bike seat. Even when I’ve said it’s perfect, I continue to look for a better position. It’s become an obsession. 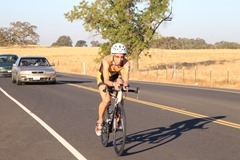 The bike is so important on this course. My family arrives in the evening and all is right in the world. On Thursday, we register and experience the first heavy smoke. 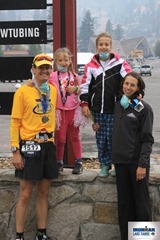 Fortunately we have dust masks. Unfortunately we didn’t bring enough for everyone that wants them. 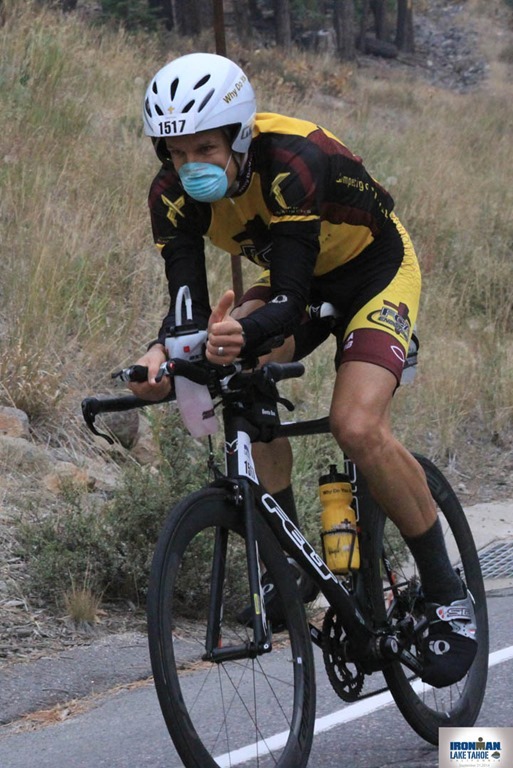 I’ve always been caferful about the air I breathe in order to keep athletically healthy the best that I can. Friday is Iron Prayer. I spend time with God and prepare for my talk. I really feel the Lord putting “Let Faith Bridge the Gap” on my heart. 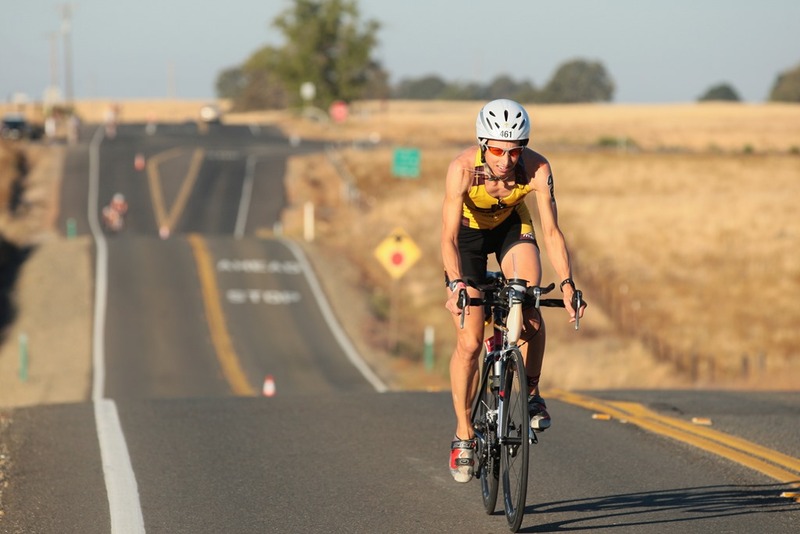 I’m convicted about my lack of faith in details for the race, particularly my bike position. I feel Him telling me to let it go and have faith He’ll make it right. The Iron Prayer goes great. I share about having faith that God will bridge those “gaps” in our plan. My friend, Troy, had reminded me often that the “gaps” were opportunities for God to show his power in. Like with my concern that my run training wasn’t enough after recovering from the broken ribs. Then Pastor Dan Perkins shared about how much we have to give, when God blesses it and multiplies it. Saturday Anna & Ariel did the Iron Kids race and did great. Despite wanting desperately to ride my bike some more and change the position lower, I committed to God that I would trust Him and turn my bike in as-is… which I did. Then we enjoyed some time on the beach. And a great carbo-load (or protein load for some) at the cabin. Everything is going well. It’s 51 degrees! With 10min to go, I put my wetsuit on next to the VIP tent where Robin & the girls are having breakfast. They give me hugs and I head off, finally ready, after a year in the making, to put myself to the test and push harder than I have in years. Then everything stopped and they announced the Ironman was cancelled. 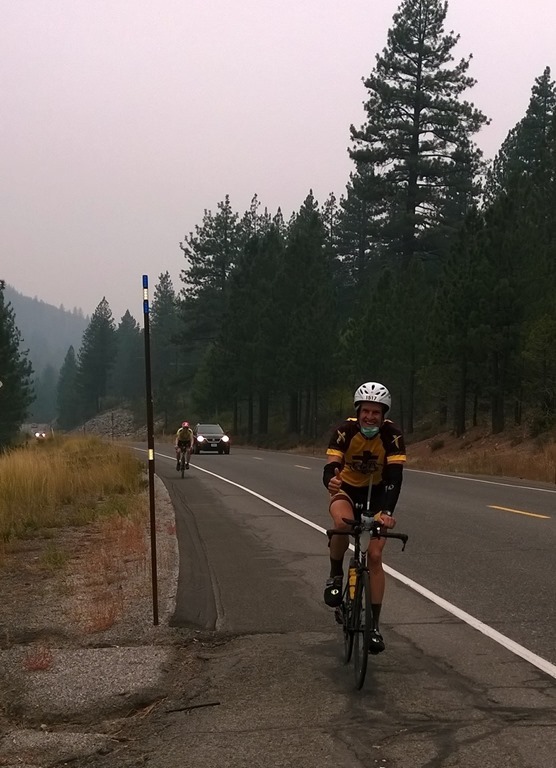 Due to bad smoke on other parts of the course. You can imagine the looks of disbelief. 2000 athletes from every state and around the world. We were sure it was just as difficult for the directors to cancel as it was for the athletes to hear it was cancelled. 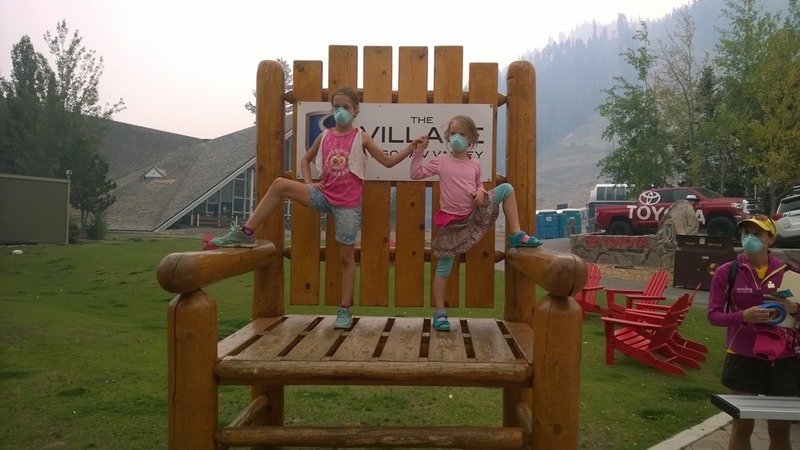 Air quality for hazardous. It was the right call to make. For me there are always 2 responses to racing. 1 side of me doesn’t want to go through extreme difficulty, and therefore is relieved the race is off. The other side knows that pushing through the challenges is important and excellent training for the challenges of life. The swim course was clear. There’s always a chance wind or rain will clear the air. 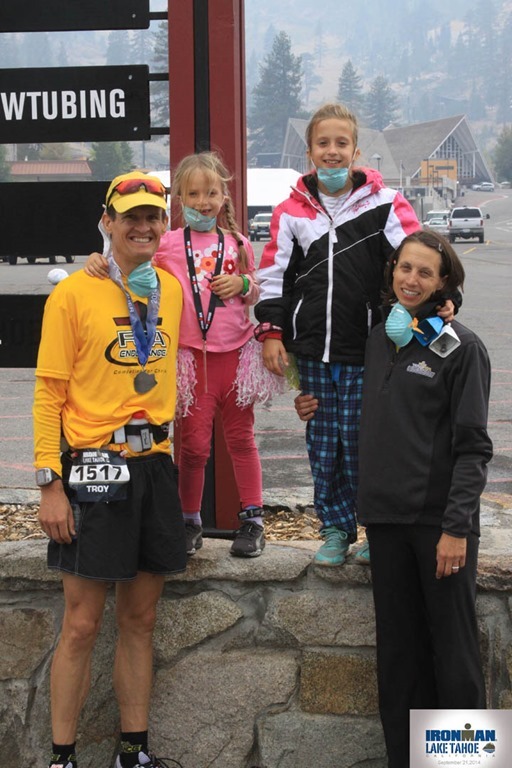 My family has been helping me train for this since the day after Robin raced last year. After today, it will be 1 or 2 years before I test myself this way again. Before giving up, we gathered together and said, “We could still do it? You sure you want to spend the whole day supporting?” My family said, “That’s what we came here for”. Anna & Ariel’s tears turned to smiles of excitement. This would be very hard, but I would race it just as planned, in hopes of qualifying! 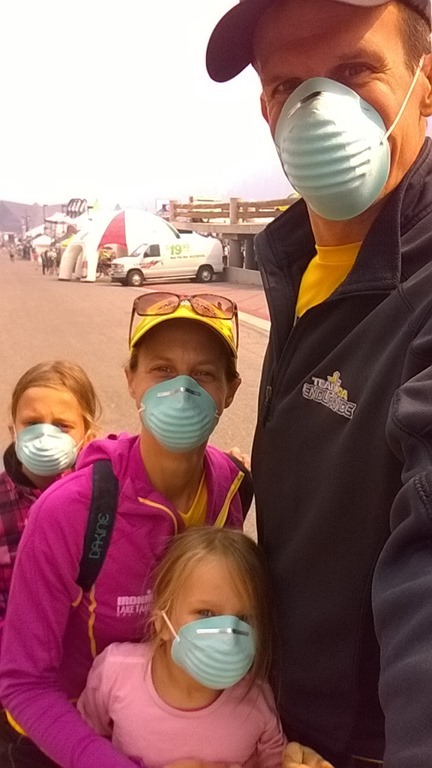 We prayed about it and would be ready to stop if conditions & breathing were too difficult. 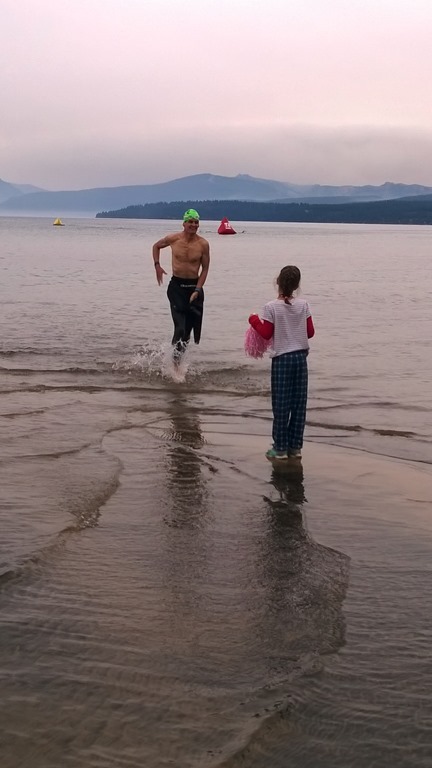 At 6:50am I said to myself, “Go!” Others were also swimming unofficially. 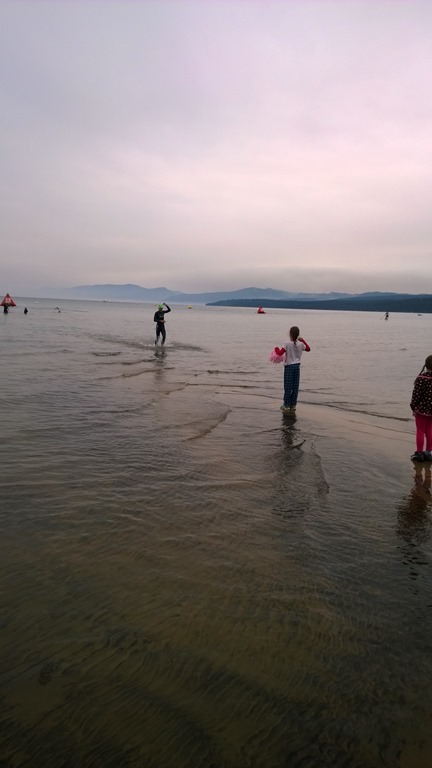 Although the race venue was being quickly disassembled, some of swim support staff, including friends Desiree Swift and her dad Bob in their kayaks, remained in place along with the buoys. Thankfully they looked over the dozens swimming the course. They were told they could leave but they stayed instead. The water was calm and clear. I didn't get too cold and was able to push well. The 2nd loop was the same as the first. I was happy with my time of 1:06 (although I didn't beat Robin's time last year). I organized my clothes well so they went on fast. But transition was still 10min. Robin handed me the painter's mask and Anna handed me my phone. I was off! 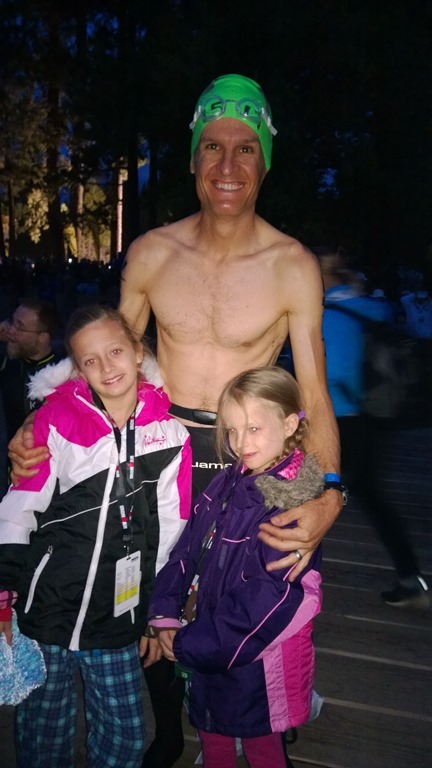 At 20mi, Robin and the girls had an aid station where I shed clothes and got water. By 30mi, I had seen about 4 other riders, but they weren't wearing masks. One was Rory Duckworth who blew by with a friendly greeting (he went on to finish it all in 10:26!) I was concerned for them as the air seemed pretty bad without it. My Garmin stopped working so I had to guess my average speed at about 21mph. At 80mi I turned into Northstar. Robin, the girls, Troy & Sarah Outman, and Flor Hodges and her son Carson were all there cheering me on and handing more water! So great! Oh, the legs were awkward for a few hundred yards. Then it looked more like a run. By 2mi I was doing better at 9:15 pace. This pace, probably not good enough to qualify with, was all I had while also trying not to breathe too hard.. which was hard around the Squaw Valley Resort. 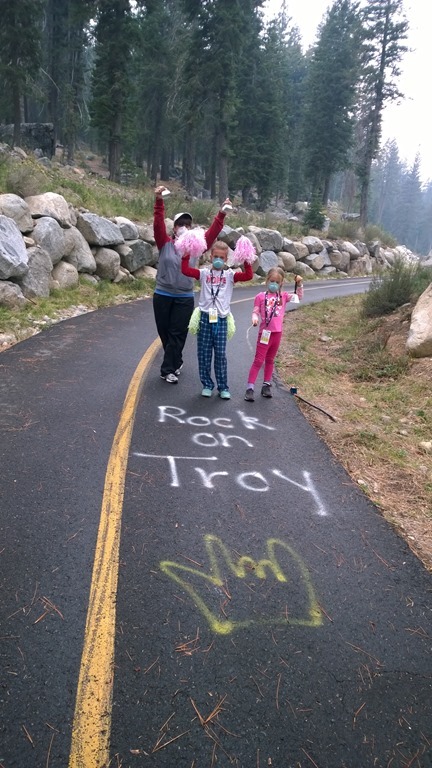 At 4mi, at Hwy 89, the team was there, the girls were dancing and cheering loudly. 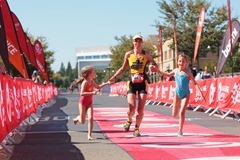 I'm very thankful for my family and friends cheering me on in the unofficial partial Ironman Lake Tahoe! 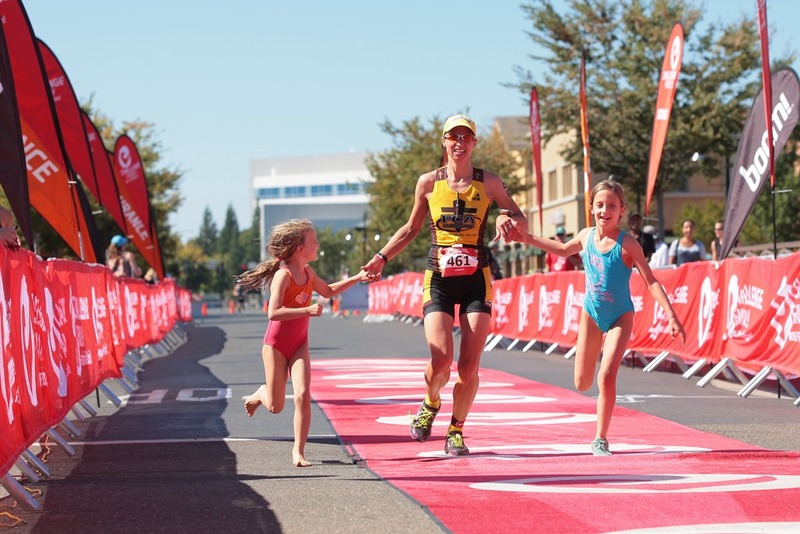 For our family, the Ironman training, racing & supporting is the pinnacle opportunity every 2 yrs. to test ourselves. So thankful I was able to do most of it anyway, accomplish my goals, and see my girls' tears turn to joy. 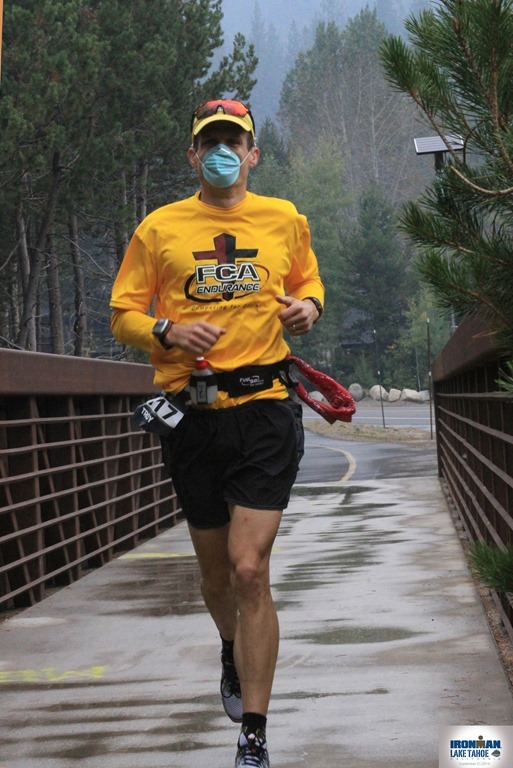 Conquering those hills in 6hrs with a mask & only nose breathing, was a huge accomplishment. 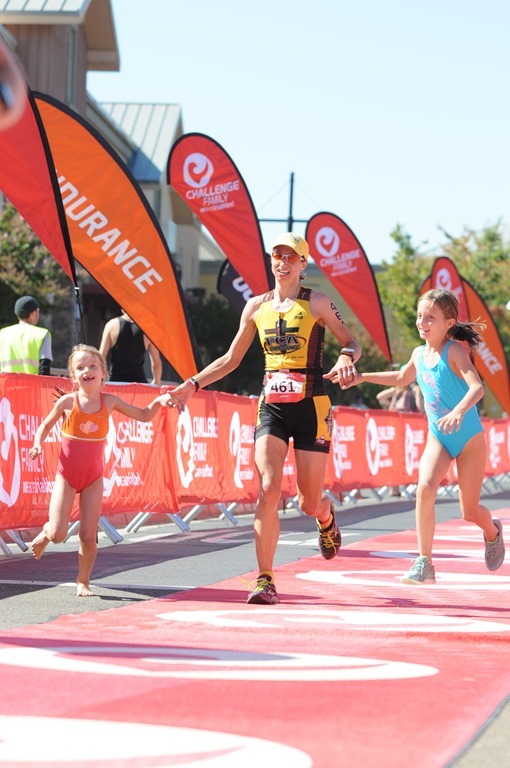 It’s not just another training day that can be done anytime, it was an Ironman. However, it’s important to understand it’s different for everyone. Breathing bad air is a risk. Some do it to earn a living and some had to do it at the Summer Olympics. For us, it was a year-long trek, almost cut short by 11 hrs, but we pushed it to within 3 hrs, until we felt from God it was right to stop. We’re all feeling fine. IM Lake Tahoe was cancelled but I’m not disappointed. Instead, it was fulfilling. For me, the memories of conquering struggles with family support are more valuable than money. And I wouldn’t be able to push like that with a smile if not for Christ in my life.